Atlanta voters will decide on a 0.5% sales tax to fund MARTA expansion this election. Major components of the plan include light rail on the BeltLine, more streetcar lines, and new MARTA stops on BeltLine intersections. MARTA has posted slides of planned expansion projects, but I have not seen projected ridership or a cost-benefit analysis. I consider the project in multiple ways below and decide that voters should not approve the tax. The proposed additions are poor choices, Atlanta residents have not demonstrated sufficient demand, the expansion would not be cost-effective, and MARTA already has growing funding sources. This is the most obvious argument in a long list. In addition to a proposed streetcar extension, there are also street-level light rails that appear to be a streetcar by another name. Any proposal that includes streetcars is not a serious proposal for public money. It's ludicrous to me that our city would spend $100 million to install three miles of train tracks in a functioning street to do exactly what a bus can already do, with the exception of not being able to avoid obstacles or re-route during street closures. The current project plan is not MARTA's first choice. The agency had plans for an $8 billion expansion last year that included a northern expansion of heavy rail. However, funding for that plan was not approved. Instead, MARTA received permission for a referendum on sales tax in the city of Atlanta only, so they've developed a second plan, mostly inside city limits. This is significant because only 10% of the metro area's population lives inside the city. A public transit solution focused inside city limits is unlikely to have a large impact on congestion. In addition to a limited geographic focus, the new plan does not serve the city's highest density areas. Consider the map below, which overlays MARTA stops and the BeltLine on top of a density map of Atlanta. The density map includes both residents and jobs. Existing MARTA rail has good coverage through the densest areas of downtown and midtown Atlanta. The BeltLine, on the other hand, circles the city mostly through less-dense areas. The busiest MARTA stops are those in high-density areas downtown, and those at the terminals, used as connectors for commuters who live outside the bounds of MARTA. Some of the least-busy stops are the intermediate east-west stops near the BeltLine. Residents there live in neighborhoods that are not dense enough to have large populations close to the station, and live close enough to downtown that waiting for a train isn't as fast as driving. BeltLine transit would be even less useful for these residents. Most riders would then have an additional transfer to get to their destination off the BeltLine, which further increases travel time and decreases use. The project list includes $11.9 billion in costs. The cost estimates suggest $3.2 billion could be covered by federal grants, leaving $8.7 billion for the city. Of course, cost projections and ability to win federal grants are usually optimistic, so the price tag could be significantly higher. The proposed tax is projected to raise $2.5 to $3.5 billion over 40 years. Because the project cost exceeds the revenue, voters do not actually know what they are voting for- some parts might not be built at all, and some will be built regardless of the referendum, through BeltLine funding or growth in MARTA’s current revenue sources. Trends over time are also helpful for thinking about the need for MARTA expansion. The graph below shows the percent change in the population, public transit usage, and traffic delay for the Atlanta metro area. The metro population grew 23% from 2002 to 2014, but public transit usage fell by 9.1% and traffic congestion fell by 3.7%. MARTA advocates have said that more public transit is needed for a growing population, but the trends over time do not support that claim. Although the population is growing, congestion and public transit use have not increased. Perhaps people are living closer to work, are more likely to telecommute, or traffic management has improved. Traffic patterns could change even more moving forward with the roll-out of self-driving cars. Atlanta should not commit to a new 40-year multi-billion dollar tax for transit infrastructure when demand is not growing and the future is even less certain. The rising population leads to another interesting point. The majority of MARTA's current funding is through a sales tax. As the population grows, MARTA's funding increases, even though their ridership has not. Sales tax revenue from the growing population should then allow MARTA to pay for gradual expansions without new taxes. 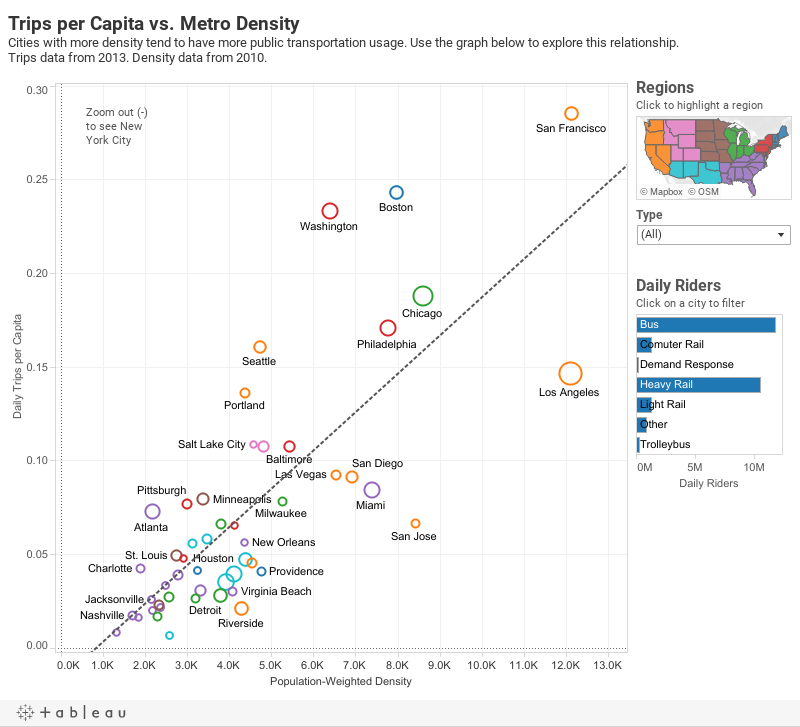 Atlanta is one of the least dense cities in the US, but for our level of density we have more transit usage than other similar cities. Given that we already have high public transit use relative to density, building more transit is less likely to be a high-return investment. Another interesting cross-city comparison is total commute time. Atlanta has the tenth longest commute times on this list, but about expected for a major city. Denser cities like New York, DC, and Boston have more public transit usage and longer commute times than Atlanta. These cities, of course, have a different commuting problem than Atlanta. Travel speed is slower in high-density cities because there are even more people in the way, and public transit makes sense for more commuters. However, Atlanta travel times are high because people are more spread out and have farther to go. Imposing the solution that works in New York or DC doesn't make sense for Atlanta. One of the main benefits of public transit is that it removes cars from the road, which reduces traffic for other drivers. The Texas A&M Transportation Institute calculates the cost of congestion per driver for cities in the US. The Atlanta cost in 2014 is $1,130 per driver. This works out to $2.17 per commuting trip (2 trips per day, 261 work days per year). The external cost of commuting is similar to the operating cost of MARTA: the cost per trip for rail was $2.05 and the cost for bus (1) was $2.74. (Costs are net of fare- rail cost per trip was $3.14, minus an average fare of $1.09.) This seems to work out nicely- taxpayers are subsidizing public transit by the same amount we benefit by reducing traffic. However, this only includes the operating costs of MARTA, and not the capital costs. Capital costs are almost half of MARTA's total budget, so the total public subsidy to each ride is actually $4-$5, which is much greater than congestion costs. Not only are current MARTA options not cost effective, but the proposed options will be even less so. The proposed options are in sub-optimal locations, which will reduce cost effectiveness, and the proportion of capital costs will be even higher, as the lines are not yet constructed. One of the arguments for public transit that is not necessarily addressed by cost benefit concerns is equity. Public transit through poor neighborhoods will give the poor access to more jobs, retail, and services and promote revitalization. Although the access component might be true (if usage is reasonably high), the revitalization component has not happened at current MARTA stops. MARTA did not receive a single market-rate housing proposal for the Oakland City transit-oriented development project. Also, several neighborhoods near south and west MARTA stops have very low home values- several below $50 per square feet. Neighborhoods with existing rail are not being revitalized, so we shouldn't assume new rail would have a different effect. Public money would be better spent improving schools and crime in Atlanta's poorest neighborhoods, or creating more targeted attempts at investment. Also, voting against the tax does not eliminate public transit from BeltLine neighborhoods; they will still be served by bus. The idea of public transit is inspirational- it's a public good that helps the poor, it connects communities, and reduces traffic congestion and pollution. Voting to support public transit gives a voter a warm glow. But let's consider not just the proposed funding, but current funding as well. MARTA funding began with a 1971 vote that approved a 1% sales tax in Fulton and Dekalb counties. The sales tax was originally scheduled to drop to 0.5% but the 1% rate has been repeatedly extended, most recently in 2007 for a list of projects that included BeltLine transit. As explained above, the 1% sales tax is already a growing revenue stream as the population increases. In addition to the current 1% MARTA sales tax, BeltLine transit also receives funding from the BeltLine tax allocation district (TAD). Property taxes from new developments and rising home values in the BeltLine TAD pay back the bonds used for BeltLine construction. So the proposed sales tax increase would be the third revenue source passed using the BeltLine as justification for funding. Further, between the proposed MARTA tax and City of Atlanta infrastructure tax, Atlanta sales tax rates would rise to 8.9%- nearly the state maximum of 9.0%. This would limit the city's flexibility to raise future funds for valuable projects- especially since the new 0.5% MARTA tax would be locked in for 40 years. We’re fortunate to live in a growing city- Atlanta will develop in exciting ways in the next forty years. But our optimism shouldn’t cause us to approve any public transit plan. Our leaders need to be accountable- present a plan of exactly what will be built, instead of presenting three times as many projects as the tax can fund. Build in neighborhoods that demonstrate demand for transit. Make a case for cost-effectiveness. And don’t build more ridiculous streetcars. You are missing something here: the Economic Development angle. It is well known among various county leaders at this point that not having mass transit disqualifies them for newly relocating large employers. It is forcing a re-consideration of mass transit in surprising ways. So, while you are considering the issue on a purely median citizen and tax utility basis, potential large employers care about access and transit, and are not going to relocate to portions of the Atlanta metro without transit. The politics of new employers and new jobs are pretty obvious. A subsidized MARTA, which can bring large quantities of high-dollar employees (many of whom want good transit to avoid Atlanta traffic; it is a recruiting issue for companies and a quality of life issue for employees), suddenly becomes a lot less of a tax burden when considering that economic development benefit. So, please consider all of the angles, not just the tax utility angle or the limited budget for the long project list when thinking about Atlanta mass transit. As far your ridership graph, you did not include that in 2008 routes were cut, headways increased, and fares increased as sales tax income decreased. The loss in ridership was due from the cost cutting measures Dr. Scott and board adopted to keep MARTA operable. Your statement regarding density is not logical. That Atlanta has high transit usage relative to density should be encouraging for transit and expansion combined with the opportunity to increase density in the areas affected. According to my information, the Atlanta is one of the cold areas but due to the increase the sun light the flow of the water increase but australianwritings writing service help you to make your work excellent. This problem is so major problem and a scientist thinks about the solution of this problem. Overall, your information is also so good. See how to spy on someones kik guys!